It has been 3 years since we have visited the Phoenix Islands Protected Area, and this is the 6th trip to study PIPA reefs. Our last trip, in 2012, was focused on launching the 10-year science plan for PIPA - expanding work on climate change, connectivity, and exploration. The fate of PIPA ecosystems is of course unknown; but even more so given the rollercoaster that they have experienced since the New England Aquarium first described them in 2000. Since then, PIPA reefs bleached in 2002-03 (the worst bleaching event in PIPA history), and then again in 2010. Coral cores (taken by our expedition partners and colleagues from the Woods Hole Oceanographic Institution) suggested that PIPA corals had not bleached prior to 2002, so these two high thermal events in a relatively short time period wreaked havoc on an otherwise nearly-pristine ecosystem. Though PIPA reefs had shown remarkably fast and promising recovery after both events, they had not yet achieved their pre-2002-glory. This trip, there is a packed agenda (as always). But our trip coincides with what is shaping up to be the worst El Nino in history. NOAA's coral reef watch has been predicting bleaching in PIPA for several weeks now, as Sea Surface Temperatures (SSTs) have been climbing towards, and then beyond, the average bleaching threshold for the region (around 30 deg C). You can see this trend in the dark blue/purple line plotted below, against the 30 deg C bleaching threshold represeted by the steady light blue line. The Sea Surface Temperatures (SST) are on the left Y axis; Degree Heating Weeks are on the right Y axis. Time (Year, Month) is plotted along the X axis. Colors in the plot correspond to bleaching alert levels. PIPA is currently at an Alert Level 2, and has been for a few months. For about 10 months now, the NOAA Coral Reef Watch program has shown temperatures that have sporadically exceeded this 30 deg C bleaching threshold; and for the past 4 months, they have remained above this threshold. However, these temperatures (extrapolated from virtual stations -- you can read more about that here) do not always reflect what is happening on-site, or at-depth. Thus, last month, when our oceanographic expedition (led by SEA) was visiting PIPA, we were thrilled that no observations of bleaching were yet reported. Needless to say: we are now all at the edge of our seats. Has PIPA bleached? We will soon know. 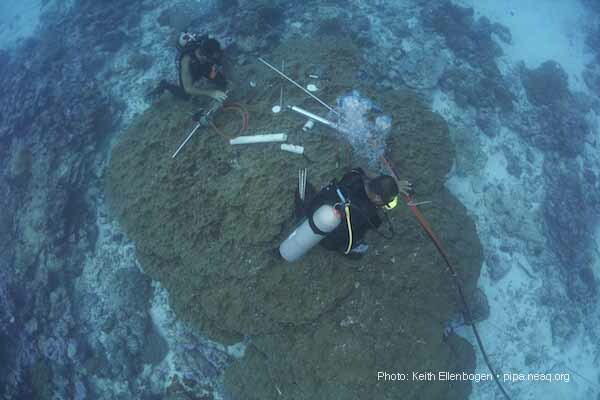 Either way, we have plans to document the current state of the reef in many ways. We will be retrieving and re-deploying temperature loggers at depth so that we can calibrate the in-water actual temperature measurements with the satellite measurements (such as from the NOAA Coral Reef Watch). We will be taking photoquadrats to look at the benthic composition of the reef. 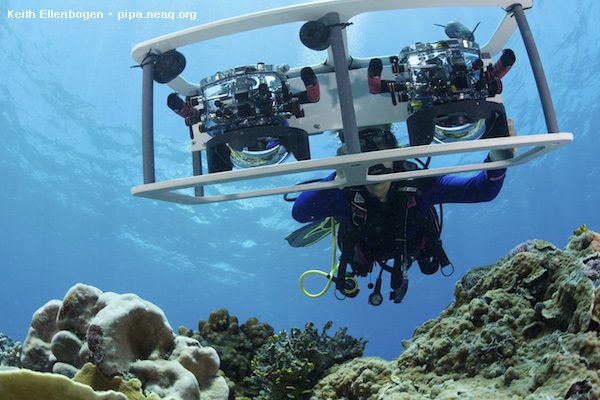 We will be taking photomosaics (large, HD composite pictures to create a map of the reef floor) so that we can carefully study a site intensively--and re-photograph it every visit--to determine change in individual coral colonies or reef areas. And we will be continuing our transect surveys for both fishes and corals, which are critical to providing measurements of diversity, abundance and biomass of reef organisms. Finally, we will sample and carefully preserve small bits of coral to genetically examine their photosynthetic endosymbionts (Symbiodinium spp). This trip, our agenda is expanding to also survey cryptic reef invertebrates. Other trip objectives related to climate change are to continue to core corals to determine the prior history of bleaching and stress for PIPA corals, to measure water chemistry and nutrients to better understand the calcification potential and nutritional potential for PIPA corals, and to deploy small devices to measure calcium accretion and erosion. More on all of these objectives (and other trip objectives!) coming soon. Together, these data will help to capture a picture of climate change, reef health and reef resilience. Until then, we are keeping our fingers crossed for healthy corals. PIPA, which is a California-sized MPA, has very little human influence (no fishing! only 30 people! no coastal development! very little ship traffic!) and should be among the more resilient places on our planet to study climate change impacts. In other words, on these reefs, climate change is essentially the only major stressor. And so...we must now wait and see.